Kid Reporter Wins National History Day Award | Kid Reporters' Notebook | Scholastic Inc.
After months of delving into historical topics, the big moment had arrived. 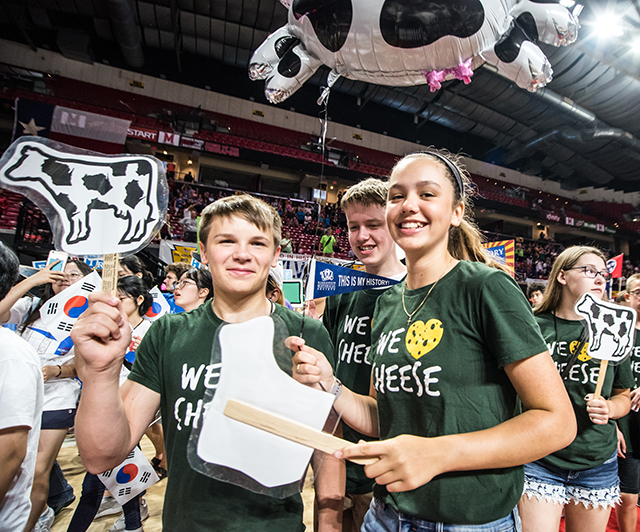 On June 10, 3,000 students from all 50 states and beyond gathered at the University of Maryland in College Park for the final rounds of the National History Day (NHD) Contest. Each year, roughly 600,000 middle and high schoolers participate in the academic program, which focuses on historical research and interpretation. The program began in 1974 in Ohio, with 29 students participating. Since then, the annual competition has expanded to include hundreds of thousands of students from the United States, Puerto Rico, Guam, China, and elsewhere. This year’s NHD theme was “Conflict and Compromise in History.” My fellow students and I began by researching a topic relating to the theme, and then squaring off in school, local, regional, and state competitions. A small percentage of competitors on the Junior and Senior levels reached the finals in Maryland. I was fortunate enough to be selected to represent my state, Wisconsin, in the Junior Individual Website category. My project focused on the Supreme Court’s role in partisan gerrymandering. This has to do with how voting district lines are drawn. In many areas, the lines have been distorted to give one political party an advantage over another in elections. The four-day event in Maryland opened with a welcome ceremony, where alumni spoke and student competitors traded pins. Pin trading is one of the most iconic elements of NHD. Each participant receives pins from their state, which they then trade with other kids. Everyone tries to build a full set of pins by the end of the competition. After the competitions, the final day arrived. It began with a parade. Students marched around the venue wearing their team shirts and showing their state pride. Because Wisconsin is one of the country’s leading dairy producers, I held a cow balloon, and my teammates shook cowbells. Some kids wrapped themselves in Wisconsin flags and waved Wisconsin pennants. After the parade, the suspense began with the announcement of awards. I was honored and proud to hear my name called. I won the silver award in my category. It is a moment that I’ll never forget.